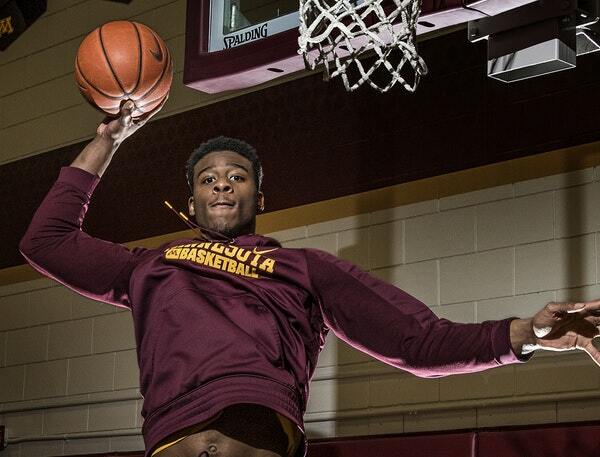 When the Gophers landed Davonte Fitzgerald as a transfer from Texas A&M two years ago, he was looked at as a potential starting forward with all-conference upside. After recovering from a second major knee injury, Fitzgerald needed time just to get healthy let alone become an impact player. But Tuesday’s 13-point, eight-rebound performance in a 100-57 win against Alabama A&M was a glimpse at what he could bring off the bench this season. “I’m just taking every game, trying to get better,” Fitzgerald said. “It was a good game and a stepping stone. Just trying to use this game to propel forward, especially health-wise." On one play in the second half, the 6-foot-8, 220-pound Georgia native pump faked a defender took a few dribbles under the basket, jumped 180 degrees and threw down an emphatic one-hand slam, his first official dunk in maroon and gold. The spring in his legs are definitely back. Through his first four games at Minnesota, Fitzgerald was averaging just 2.8 points and 2.0 rebounds in 10.8 minutes. It wasn’t the start he and the Gophers were expecting, but he just needed to get comfortable after sitting out two whole seasons. Before his Gophers debut earlier this month, he hadn’t played a regular season game since with the Aggies in 2014-15. After losing sophomore Eric Curry for the season, Pitino said Fitzgerald needs to be able to help fill that backup power forward spot behind Jordan Murphy. One of Pitino’s priorities in the 2017 recruiting class was to add an outside threat to poor three-point shooting Gophers team from a season ago. That’s where Jamir Harris comes in. Harris, a 6-2 freshman guard from the Patrick School in New Jersey, led one of the nation’s top high school teams with his long range expertise last year. And his stroke has so far carried over to the next level. Harris has become the Gophers’ best three-point shooter through five games. He’s averaging 5.8 points and shooting 53.8 percent from beyond the arc (7-for-13), which ranks sixth in the Big Ten. Pitino isn’t worried about fellow freshman Isaiah Washington struggling with his outside shooting. Washington is averaging 7.2 points, but he’s shooting just 11.8 percent from three (2-for-17). Rarely-used senior big man Gaston Diedhiou saw his first extended playing time of the season Tuesday against Alabama A&M. The 6-10 Senegal native made the most of it with career-highs in points (six) and blocks (three) and a steal in eight minutes. That was more productive than senior center Bakary Konate’s two points, two rebounds and a steal in 12 minutes Tuesday. Could we see Diedhiou playing more in the future? One game against arguably the worst team in college basketball is probably not enough to make that assumption yet.